Luciano Pavarotti, Cavaliere di Gran Croce OMRI (/ˌpɑːvəˈrɔːti/; Italian: [luˈtʃaːno pavaˈrɔtti]; 12 October 1935 – 6 September 2007) was an Italian operatic tenor who also crossed over into popular music, eventually becoming one of the most commercially successful tenors of all time. He made numerous recordings of complete operas and individual arias, gaining worldwide fame for the quality of his tone, and eventually established himself as one of the finest tenors of the 20th century, achieving the honorific title The King Of High C's. As one of the Three Tenors who performed their first concert during the 1990 FIFA World Cup before a global audience, Pavarotti became well known for his televised concerts and media appearances. From the beginning of his professional career as a tenor in 1961 in Italy to his final performance of "Nessun dorma" at the 2006 Winter Olympics in Turin, Pavarotti was at his best in bel canto operas, pre-Aida Verdi roles, and Puccini works such as La bohème, Tosca, Turandot and Madama Butterfly. He sold over 100 million records, and the first Three Tenors recording became the best-selling classical album of all time. Pavarotti was also noted for his charity work on behalf of refugees and the Red Cross, amongst others. He died from pancreatic cancer on 6 September 2007. In 1955, he experienced his first singing success when he was a member of the Corale Rossini, a male voice choir from Modena that also included his father, which won first prize at the International Eisteddfod in Llangollen, Wales. He later said that this was the most important experience of his life, and that it inspired him to become a professional singer. At about this time Pavarotti first met Adua Veroni. They married in 1961. He made his first international appearance in La traviata in Belgrade, Yugoslavia. Very early in his career, on 23 February 1963, he debuted at the Vienna State Opera in the same role. In March and April 1963 Vienna saw Pavarotti again as Rodolfo and as Duca di Mantova in Rigoletto. The same year saw his first concert outside Italy when he sang in Dundalk, Ireland for the St Cecilia's Gramophone Society and his Royal Opera House debut, where he replaced an indisposed Giuseppe Di Stefano as Rodolfo. While generally successful, Pavarotti's early roles did not immediately propel him into the stardom that he would later enjoy. An early coup involved his connection with Joan Sutherland (and her conductor husband, Richard Bonynge), who in 1963 had sought a young tenor taller than herself to take along on her tour to Australia. With his commanding physical presence, Pavarotti proved ideal. 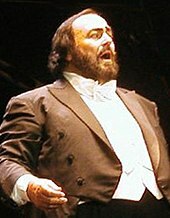 The two sang some forty performances over two months, and Pavarotti later credited Sutherland for the breathing technique that would sustain him over his career. Pavarotti made his American début with the Greater Miami Opera in February 1965, singing in Donizetti's Lucia di Lammermoor opposite Joan Sutherland on the stage of the Miami-Dade County Auditorium in Miami. The tenor scheduled to perform that night became ill with no understudy. 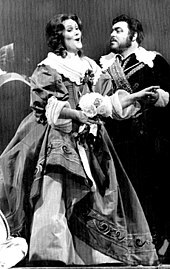 As Sutherland was traveling with him on tour, she recommended the young Pavarotti as he was well acquainted with the role. Shortly after, on 28 April, Pavarotti made his La Scala debut in the revival of the famous Franco Zeffirelli production of La bohème, with his childhood friend Mirella Freni singing Mimi and Herbert von Karajan conducting. Karajan had requested the singer's engagement. After an extended Australian tour, he returned to La Scala, where he added Tebaldo from I Capuleti e i Montecchi to his repertoire on 26 March 1966, with Giacomo Aragall as Romeo. His first appearance as Tonio in Donizetti's La fille du régiment took place at the Royal Opera House, Covent Garden, on 2 June of that year. It was his performances of this role that would earn him the title of "King of the High Cs". He scored another major triumph in Rome on 20 November 1969 when he sang in I Lombardi opposite Renata Scotto. This was recorded on a private label and widely distributed, as were various recordings of his I Capuleti e i Montecchi, usually with Aragall. Early commercial recordings included a recital of Donizetti (the aria from Don Sebastiano were particularly highly regarded) and Verdi arias, as well as a complete L'elisir d'amore with Sutherland. His major breakthrough in the United States came on 17 February 1972, in a production of La fille du régiment at New York's Metropolitan Opera, in which he drove the crowd into a frenzy with his nine effortless high Cs in the signature aria. He achieved a record seventeen curtain calls. Pavarotti sang his international recital début at William Jewell College in Liberty, Missouri, on 1 February 1973, as part of the college's Fine Arts Program, now known as the Harriman-Jewell Series. Perspiring due to nerves and a lingering cold, the tenor clutched a handkerchief throughout the début. The prop became a signature part of his solo performances. He began to give frequent television performances, starting with his performances as Rodolfo (La bohème) in the first Live from the Met telecast in March 1977, which attracted one of the largest audiences ever for a televised opera. He won many Grammy awards and platinum and gold discs for his performances. In addition to the previously listed titles, his La favorite with Fiorenza Cossotto and his I puritani (1975) with Sutherland stand out. In 1976, Pavarotti debuted at the Salzburg Festival, appearing in a solo recital on 31 July, accompanied by pianist Leone Magiera. Pavarotti returned to the festival in 1978 with a recital and as the Italian singer in Der Rosenkavalier in 1983 with Idomeneo, and both in 1985 and 1988 with solo recitals. In 1979, he was profiled in a cover story in the weekly magazine Time. That same year saw Pavarotti's return to the Vienna State Opera after an absence of fourteen years. With Herbert von Karajan conducting, Pavarotti sang Manrico in Il trovatore. In 1978, he appeared in a solo recital on Live from Lincoln Center. At the beginning of the 1980s, he set up The Pavarotti International Voice Competition for young singers, performing with the winners in 1982 in excerpts of La bohème and L'elisir d'amore. The second competition, in 1986, staged excerpts of La bohème and Un ballo in maschera. To celebrate the 25th anniversary of his career, he brought the winners of the competition to Italy for gala performances of La bohème in Modena and Genoa, and then to China where they staged performances of La bohème in Beijing (Peking). To conclude the visit, Pavarotti performed the inaugural concert in the Great Hall of the People before 10,000 people, receiving a standing ovation for nine effortless high Cs. The third competition in 1989 again staged performances of L'elisir d'amore and Un ballo in maschera. 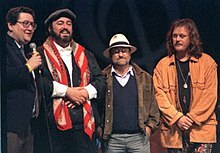 The winners of the fifth competition accompanied Pavarotti in performances in Philadelphia in 1997. In the mid-1980s, Pavarotti returned to two opera houses that had provided him with important breakthroughs, the Vienna State Opera and La Scala. Vienna saw Pavarotti as Rodolfo in La bohème with Carlos Kleiber conducting and again Mirella Freni was Mimi; as Nemorino in L'elisir d'amore; as Radames in Aida conducted by Lorin Maazel; as Rodolfo in Luisa Miller; and as Gustavo in Un ballo in maschera conducted by Claudio Abbado. In 1996, Pavarotti appeared for the last time at the Staatsoper in Andrea Chénier. In 1985, Pavarotti sang Radames at La Scala opposite Maria Chiara in a Luca Ronconi production conducted by Maazel, recorded on video. His performance of the aria "Celeste Aida" received a two-minute ovation on the opening night. He was reunited with Mirella Freni for the San Francisco Opera production of La bohème in 1988, also recorded on video. In 1992, La Scala saw Pavarotti in a new Zeffirelli production of Don Carlos, conducted by Riccardo Muti. Pavarotti's performance was heavily criticized by some observers and booed by parts of the audience. Pavarotti became even better known throughout the world in 1990 when his rendition of the aria "Nessun dorma" from Giacomo Puccini's Turandot was taken as the theme song of BBC's coverage of the 1990 FIFA World Cup in Italy. The aria achieved pop status, became the World Cup soundtrack, and it remained his trademark song. This was followed by the first Three Tenors concert, held on the eve of the 1990 FIFA World Cup Final at the ancient Baths of Caracalla in Rome with fellow tenors Plácido Domingo and José Carreras and conductor Zubin Mehta. The performance for the World Cup closing concert captivated a global audience, and it became the biggest selling classical record of all time. A highlight of the concert, in which Pavarotti hammed up a famous portion of di Capua's "O Sole Mio" and was mimicked by Domingo and Carreras to the delight of the audience, became one of the most memorable moments in contemporary operatic history. Throughout the 1990s, Pavarotti appeared in many well-attended outdoor concerts, including his televised concert in London's Hyde Park, which drew a record attendance of 150,000. In June 1993, more than 500,000 listeners gathered for his free performance on the Great Lawn of New York's Central Park, while millions more around the world watched on television. The following September, in the shadow of the Eiffel Tower in Paris, he sang for an estimated crowd of 300,000. Following on from the original 1990 concert, the Three Tenors concerts were held during the three subsequent FIFA World Cup Finals, in 1994 in Los Angeles, 1998 in Paris, and 2002 in Yokohama. In September 1995, Pavarotti performed Ave Maria along with Dolores O'Riordan; Diana, Princess of Wales, who attended the live performance, told O'Riordan that the song brought her to tears. In 1995, Pavarotti's friends, the singer Lara Saint Paul (as Lara Cariaggi) and her husband showman Pier Quinto Cariaggi, who had produced and organised Pavarotti's 1990 FIFA World Cup Celebration Concert at the PalaTrussardi in Milan, produced and wrote the television documentary The Best is Yet to Come, an extensive biography about the life of Pavarotti. Lara Saint Paul was the interviewer for the documentary with Pavarotti, who spoke candidly about his life and career. Pavarotti's rise to stardom was not without occasional difficulties, however. He earned a reputation as "The King of Cancellations" by frequently backing out of performances, and his unreliable nature led to poor relationships with some opera houses. This was brought into focus in 1989 when Ardis Krainik of the Lyric Opera of Chicago severed the house's 15-year relationship with the tenor. Over an eight-year period, Pavarotti had cancelled 26 out of 41 scheduled appearances at the Lyric, and the decisive move by Krainik to ban him for life was well noted throughout the opera world, after the performer walked away from a season premiere less than two weeks before rehearsals began, saying pain from a sciatic nerve required two months of treatment. On 12 December 1998, he became the first (and, to date, only) opera singer to perform on Saturday Night Live, singing alongside Vanessa L. Williams. He also sang with U2 in the band's 1995 song "Miss Sarajevo" and with Mercedes Sosa in a big concert at the Boca Juniors arena La Bombonera in Buenos Aires, Argentina, in 1999. In 1998, Pavarotti was presented with the Grammy Legend Award. In 2004, one of Pavarotti's former managers, Herbert Breslin, published a book, The King & I. Seen by many as bitter and sensationalistic,[by whom?] it is critical of the singer's acting (in opera), his inability to read music well and learn parts, and his personal conduct, although acknowledging their success together. In an interview in 2005 with Jeremy Paxman on the BBC, Pavarotti rejected the allegation that he could not read music, although he acknowledged he did not read orchestral scores. He received an enormous number of awards and honours, including Kennedy Center Honors in 2001. He also holds two Guinness World Records: one for receiving the most curtain calls (165) and another for the best-selling classical album (Carreras Domingo Pavarotti in Concert by the Three Tenors; the latter record is thus shared by fellow tenors Plácido Domingo and José Carreras). In late 2003, he released his final compilation—and his first and only "crossover" album, Ti Adoro. Most of the 13 songs were written and produced by Michele Centonze, who had already helped produce the "Pavarotti & Friends" concerts between 1998 and 2000. The tenor described the album as a wedding gift to Nicoletta Mantovani. That same year he was made a Commander of Monaco's Order of Cultural Merit. Pavarotti began his farewell tour in 2004, at the age of 69, performing one last time in old and new locations, after more than four decades on the stage. On 13 March 2004, Pavarotti gave his last performance in an opera at the New York Metropolitan Opera, for which he received a long standing ovation for his role as the painter Mario Cavaradossi in Giacomo Puccini's Tosca. On 1 December 2004, he announced a 40-city farewell tour. 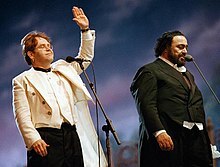 Pavarotti and his manager, Terri Robson, commissioned impresario Harvey Goldsmith to produce the Worldwide Farewell Tour. His last full-scale performance was at the end of a two-month Australasian tour in Taiwan in December 2005. In March 2005, Pavarotti underwent neck surgery to repair two vertebrae. In early 2006, he underwent further back surgery and contracted an infection while in the hospital in New York, forcing cancellation of concerts in the U.S., Canada, and the U.K.
On 10 February 2006, Pavarotti sang "Nessun dorma" at the 2006 Winter Olympics opening ceremony in Turin, Italy, at his final performance. In the last act of the opening ceremony, his performance received the longest and loudest ovation of the night from the international crowd. Leone Magiera, who directed the performance, revealed in his 2008 memoirs, Pavarotti Visto da Vicino, that the performance had been recorded weeks earlier. "The orchestra pretended to play for the audience, I pretended to conduct and Luciano pretended to sing. The effect was wonderful," he wrote. Pavarotti's manager, Terri Robson, said that the tenor had turned the Winter Olympic Committee's invitation down several times because it would have been impossible to sing late at night in the subzero conditions of Turin in February. The committee eventually persuaded him to take part by prerecording the song. He posthumously received the Italy-USA Foundation's America Award in 2013. Pavarotti annually hosted the Pavarotti & Friends charity concerts in his home town of Modena Italy, joining with singers from all parts of the music industry, including B.B. King, Andrea Bocelli, Zucchero, Jon Bon Jovi, Bryan Adams, Bono, James Brown, Mariah Carey, Eric Clapton, Sheryl Crow, Céline Dion, Anastacia, Elton John, Deep Purple, Meat Loaf, Queen, George Michael, Tracy Chapman, the Spice Girls, Sting and Barry White to raise money for several UN causes. Concerts were held for War Child, and victims of war and civil unrest in Bosnia, Guatemala, Kosovo and Iraq. After the war in Bosnia, he financed and established the Pavarotti Music Centre in the southern city of Mostar to offer Bosnia's artists the opportunity to develop their skills. For these contributions, the city of Sarajevo named him an honorary citizen in 2006. He performed at benefit concerts to raise money for victims of tragedies such as the Spitak earthquake that killed 25,000 people in northern Armenia in December 1988, and sang Gounod's Ave Maria with legendary French pop music star and ethnic Armenian Charles Aznavour. He was a close friend of Diana, Princess of Wales. They raised money for the elimination of land mines worldwide. He was invited to sing at her funeral service, but declined to sing, as he felt he could not sing well "with his grief in his throat". Nonetheless, he attended the service. In 1998, he was appointed the United Nations Messenger of Peace, using his fame to raise awareness of UN issues, including the Millennium Development Goals, HIV/AIDS, child rights, urban slums and poverty. In 1999, Pavarotti performed a charity benefit concert in Beirut, to mark Lebanon's reemergence on the world stage after a brutal 15 year civil war. The largest concert held in Beirut since the end of the war, it was attended by 20,000 people who travelled from countries as distant as Saudi Arabia and Bulgaria.In 1999 he also hosted a charity benefit concert to build a school in Guatemala, for Guatemalan civil war orphanes. It was named after him Centro Educativo Pavarotti. Now the foundation of nobel prize winner Rigoberta Menchú Tum is running the school. In 2001, Pavarotti received the Nansen Medal from the UN High Commission for Refugees for his efforts raising money on behalf of refugees worldwide. Through benefit concerts and volunteer work, he has raised more than any other individual. Also in 2001, Pavarotti was chosen one of that year's five recipients by the President and First Lady as an honoree for their lifetime achievements in the arts at the White House, followed by the Kennedy Center; the Kennedy Center Honors, He was surprised by the appearance of Secretary-General of the United Nations and that year's winner of the Nobel Peace Prize, Kofi Annan, who lauded him for his contribution to humankind. Six months prior, Pavarotti had held a large charity concert for Afghan refugees, particularly children in his home town of Modena, Italy. Other honours he received include the "Freedom of London Award" and The Red Cross "Award for Services to Humanity", for his work in raising money for that organization, and the 1998 "MusiCares Person of the Year", given to humanitarian heroes by the National Academy of Recording Arts and Sciences. Grave of Luciano Pavarotti and his family in Montale. While proceeding with an international "farewell tour", Pavarotti was diagnosed with pancreatic cancer in July 2006. The tenor fought back against the implications of this diagnosis, undergoing major abdominal surgery and making plans for the resumption and conclusion of his singing commitments, but he died at his home in Modena on 6 September 2007. Within hours of his death, his manager, Terri Robson, noted in an e-mail statement, "The Maestro fought a long, tough battle against the pancreatic cancer which eventually took his life. In fitting with the approach that characterized his life and work, he remained positive until finally succumbing to the last stages of his illness". Pavarotti's funeral was held at Modena Cathedral. The then Prime Minister Romano Prodi and Kofi Annan attended. The Frecce Tricolori, the aerobatic demonstration team of the Italian Air Force, flew overhead, leaving green-white-red smoke trails. After a funeral procession through the centre of Modena, Pavarotti's coffin was taken the final ten kilometres to Montale Rangone, a village part of Castelnuovo Rangone, and was interred in the Pavarotti family crypt. The funeral, in its entirety, was also telecast live on CNN. The Vienna State Opera and the Salzburg Festival Hall flew black flags in mourning. Tributes were published by many opera houses, such as London's Royal Opera House. Pavarotti is also survived by three other daughters by his first wife Adua, to whom he was married for 34 years: Lorenza, Cristina, and Giuliana. On 13 December 2003, he married his former personal assistant, Nicoletta Mantovani (born 1969), with whom he already had another daughter, Alice. Alice's twin brother, Riccardo, was stillborn after complications in January 2003. At the time of his death, he had one granddaughter. Pavarotti long claimed Monte Carlo in the tax haven of Monaco as his official residence, but an Italian court in 1999 rejected that claim by ruling that his Monaco address could not accommodate his entire family. In 2000 Pavarotti agreed to pay the Italian government more than $7.6 million in back taxes and penalties as a result of tax evasion charges that dated from 1989 to 1995. Pavarotti was subsequently acquitted by an Italian court of filing false tax returns in 2001. His first will was opened the day after his death; a second will, within the same month of September. He left an estate outside his native Modena, a villa in Pesaro, his flat in Monte Carlo, and three flats in New York City. Pavarotti's widow's lawyers, Giorgio Bernini and Anna Maria Bernini, and manager Terri Robson announced on 30 June 2008 that his family amicably settled his estate—300 million euros ($474.2 million, including $15 million in U.S. assets). Pavarotti drafted two wills before his death: one divided his assets by Italian law, giving half to his second wife, Nicoletta Mantovani, and half to his four daughters; the second gave his U.S. holdings to Mantovani. The judge confirmed the compromise by the end of July 2008. However, a Pesaro public prosecutor, Massimo di Patria, investigated allegations that Pavarotti was not of sound mind when he signed the will. 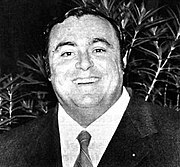 Pavarotti's estate has been settled "fairly", a lawyer for Mantovani said in statements after reports of a dispute between her and his three daughters from his first marriage. In addition to his very large discography of opera performances Pavarotti also made many classical crossover and pop recordings, the Pavarotti & Friends series of concerts and, for Decca, a series of studio recital albums: first six albums of opera arias and then, from 1979, six albums of Italian song. Arias by Verdi & Donizetti – Arias from Luisa Miller, I due Foscari, Un ballo in maschera, Macbeth, Lucia di Lammermoor, Il duca d’Alba, La favorita and Don Sebastiano (with the Wiener Opernorchester under Edward Downes, 1968). Mamma – songs by Cesare Andrea Bixio, Ernesto de Curtis, Arturo Buzzi-Peccia, Stanislao Gastaldon, Cesare Cesarini, A. Walter Kramer, Carlo Innocenzi, Giovanni D'Anzi, Eldo di Lazzaro, Vincenzo De Crescenzo, Domenico Martuzzi, Aniello Califano, Colombino Arona. Arranged and conducted by Henry Mancini, 1984. ^ "Obituary: Luciano Pavarotti". The Times. London. 6 September 2007. Archived from the original on 25 July 2008. ^ Kington, Tom (7 April 2008). "Pavarotti mimed at final performance". The Guardian. London. Retrieved 7 April 2008. ^ "In carriera ha venduto 100 milioni di dischi - Il mito Pavarotti". Il Quotidiano (in Italian). 6 September 2007. ^ Gareth Malone (28 April 2011). Music for the People: The Pleasures and Pitfalls of Classical Music. HarperCollins Publishers. pp. 34–. ISBN 978-0-00-739618-4. Retrieved 30 July 2013. ^ "Luciano Pavarotti Biography (1935-)". Retrieved 2 January 2017. ^ "Pavarotti eisteddfod career start". BBC Online. 6 September 2007. Retrieved 7 September 2007. ^ Joan Sutherland quoted in Paul Arendt, "It Was All About the Voice," The Guardian, (London), 7 September 2007: "The young Pavarotti was a revelation to the opera world. He made his debut in the United States with us in Miami in 1965. He then came as part of our company to Australia, where he sang three times a week for 14 weeks, and we went on to make countless recordings together". ^ "TIME Magazine Cover: Luciano Pavarotti - Sep. 24, 1979". Retrieved 2 January 2017. ^ "A riot of colour, emotion and memories: the World Cup stands alone in the field of sport". The Independent. Retrieved 20 August 2018. ^ "Pavarotti, top tenors sing for World Cup crowds". Upi. Retrieved 24 August 2018. ^ The Music Industry Handbook. Routledge. 2016. p. 219. ^ J-P, Mauro (15 January 2018). "When the Cranberries' Dolores O'Riordan sang 'Ave Maria' with Pavarotti". Aleteia. Retrieved 18 January 2018. ^ "New York Public Library Web Server 1 /All Locations". Retrieved 2 January 2017. ^ Block, Mervin (15 October 2004). "'60 Minutes' Story About Singer Hits False Note". Poynter Online. Retrieved 28 September 2009. ^ "Amazon.com: The Pavarotti & Friends Collection: The Complete Concerts, 1992-2000: Luciano Pavarotti: Movies & TV". Retrieved 2 January 2017. ^ "Pavarotti 'will return to stage'". BBC News. 25 July 2006. Retrieved 5 September 2007. ^ Kington, Tom (7 April 2008). "Pavarotti mimed at final performance". The Guardian. London. Retrieved 28 August 2009. ^ "Sarajevo authorities name Pavarotti honorary citizen". Deseret News (Salt Lake City). 22 February 2006. Retrieved on 29 April 2017. ^ Crossette, Barbara (30 May 2001). "United Nations: Honor For Tenor With Midas Touch". The New York Times. Retrieved 6 September 2007. ^ Farhi, Paul (3 December 2001). "Command Performance". The Washington Post. Retrieved 20 February 2017. ^ "Luciano Pavarotti- Kennedy center 2001". Kennedy Center Honors. Retrieved 20 February 2017. ^ "Freedom of London for Pavarotti". Entertainment. BBC News. 13 September 2005. Retrieved 6 September 2007. ^ "Singer Luciano Pavarotti recovering from pancreatic cancer surgery". Fox News. 7 July 2006. Archived from the original on 9 July 2007. Retrieved 5 September 2007. ^ "BBC NEWS - Entertainment - Thousands bid Pavarotti farewell". Retrieved 2 January 2017. ^ "Black flag flies over Vienna Opera House for Pavarotti". Agence France-Presse. 6 September 2007. Retrieved 6 September 2007. ^ Castonguay, Gilles (6 September 2007). "Luciano Pavarotti dead at 71". Reuters. Archived from the original on 11 October 2007. Retrieved 6 September 2007. ^ "Pavarotti tax bill. ", The Times, London, 27 April 1999. ^ "Pavarotti wins tax case. ", The Times, London, 20 October 2001. ^ Hooper, John (19 September 2007). "Pavarotti's will leaves US property to his second wife". The Guardian. London. Retrieved 16 October 2007. ^ Owen, Richard (11 September 2007). "Pavarotti's manager on his last days". The Times. London. Retrieved 14 October 2007. ^ Lee, Felicia R. (1 July 2008). "Pavarotti's Daughters and Widow Reach Deal". The New York Times. Retrieved 5 April 2010. ^ Ivan March, Edward Greenfield, Robert Layton (2008), "'The Decca Studio Albums' Disc 1 (1968): Arias by (with VPO, Downes) The Verdi and Donizetti collection was one of Pavarotti's earliest recital discs" in The Penguin Guide to Recorded Music, London: Penguin Books Ltd., 2003 ISBN 0-14-101384-2. p. 1544. This page is based on the Wikipedia article Luciano Pavarotti; it is used under the Creative Commons Attribution-ShareAlike 3.0 Unported License (CC-BY-SA). You may redistribute it, verbatim or modified, providing that you comply with the terms of the CC-BY-SA.